Facebook is already the largest social network in the world, but the company has plans to further its involvement in your everyday life. Today, the monolith announced the rollout of a variety of new features meant to shape the social activities of its users, ostensibly making it easier to purchase things, schedule appointments and find social gatherings with the aid of your friends. At a press event in San Francisco, Andrew Bosworth, Facebook's VP of ads and business platforms, told reporters that because having a social life is so damn perplexing in the 21st century, Facebook is here to help. "It's an unbelievably challenging process in 2016 to figure out what there is to go do, and then, among those things, decide which of those things you want to go do and then actually engage in the doing of said things." 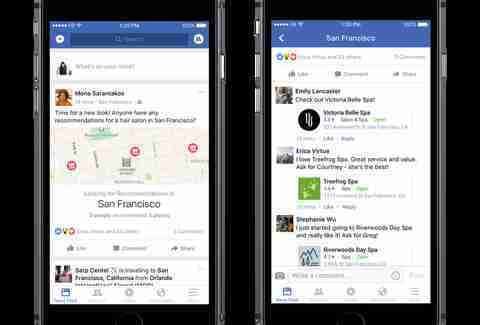 To that end, Facebook will allow users to gather recommendations from friends by sharing maps on their News Feeds. So if you’re in a new city, and have a hankering for chicken and waffles, just turn on your Recommendations setting, and friends can suggest restaurants that will then appear tagged in a map. This goes for any business with a Facebook page, from burlesque clubs to your local Toys R’ Us. Your events dashboard is also getting a makeover, as Facebook describes in a statement: “You can catch up on the latest events activity from friends and hosts and browse event recommendations based on what’s popular with friends or events you’ve connected with in the past.” This feature will roll out in the coming weeks, according to Facebook. 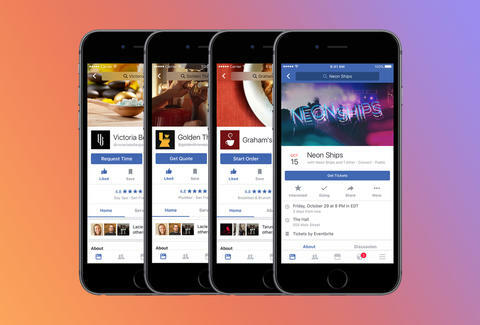 Now, the company already lets users wire money on Facebook, but the new features offer an expanded set of opportunities for e-commerce, such as buying tickets for movies and events, in addition to booking appointments at local businesses. In order to book an appointment at a hair salon or firm up a dinner reservation, use the Messenger app to swap available times to set an appropriate date. You can even order food directly from a restaurant's Facebook page. This all comes from a variety of corporate partnerships with Fandango.com, Delivery.com, Ticketmaster, Eventbrite and other companies. The glut of new features -- which are starting to roll out in the United States today -- seem like a marked attempt for Facebook to solve its longstanding conundrum when it comes to mobile. If successful, it’ll help organize your life, keeping you permanently affixed to your smartphone, preferably in a hoax-free capacity.